Caption slip reads: "Photographer: Olmo. Date: 03-25. Reporter: Markson. 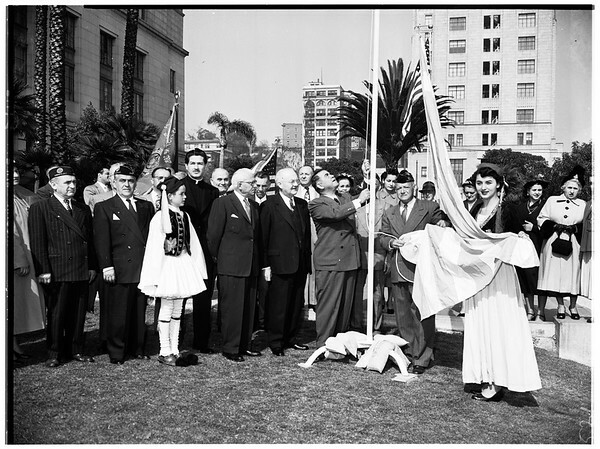 Assignment: Greek flag raising, Greek Independence Way. 23: Christine Angelos, holding flag, James Praglanis (in this shot Jimmy Angelos is between Praglanis and Skouras), Charles P. Skouras, Mayor Bowron, A.K. Mellos, Father Leonidas Contos, Jimmy Angelos, Peter Polities, Andy Bayeorgos". "Edits: "Peter Polities, Andy Praglanis".